According to information posted to the official Sailor Moon site we have three new Sailor Moon musicals coming in 2018 and 2019! This follows the conclusion of the current series of musicals with the Pretty Guardian Sailor Moon Le Mouvement Final musical this past summer. We’re getting something a bit different with each of these musicals this time around. With each being its own thing it doesn’t seem like they will necessarily follow a continuity as musicals have in the past. What’s more it doesn’t look like these will be traditional musicals but rather Sailor Moon themed concerts. Because of this I’m not sure I would label such as thing as “Seramyu” as the other musicals generally are, but it remains to be seen exactly how things develop to say for sure. The first of the concerts will feature Nogizaka46 which is an all female pop band similar to AKB48. The band of 46 members will somehow perform this Sailor Moon themed concert though we don’t really have details on what this would entail. The next is dubbed The Super Live. What does this mean? The title reminded me of Kirari Super Live which was the name of the concert put on by the cast of the live action Pretty Guardian Sailor Moon series. The site describes it as a mix of singing, dancing and video gimmicks. We are told that TAKAHIRO will be putting this show together though I can’t say I understand who that is. This particular concert will be performed at the Japonismes event. This is a sort of Japanese cultural expo that takes place in Paris, France. Finally the 3rd musical is… something we don’t really know anything about. It’s just referred to as the new musical. We’ll have to wait until we learn more about that. Will all three of these really be done by the end of 2019? With the endless delays to Sailor Moon Crystal one shouldn’t put too much faith in the timeline until we get some specifics. I wouldn’t book those plane tickets just yet! An article has appeared on the European TOEI Animation Page which speaks of Sailor Moon Crystal airing in France on Canal J starting this Fall. We previously reported on this when the series was said to begin airing in March, which has not yet happened. A second season is currently under production in Japan where the broadcast will start this summer. This certainly would be big news as the current plan was to have Sailor Moon Crystal run for only 26 episodes and conclude at the end of the Black Moon Clan story arc. While fans have been wondering if the show would continue after this for the Infinity story arc, the third story arc of the manga, there has been so such confirmation to date. Une deuxième saison est actuellement en cours de production au Japon. This quote clearly states a second season is in production in Japan but it does not mention that it is set to air this summer. This clarification is crucial. While the show is currently in it’s first year many are referring to the Black Moon Clan story arc, which we have been referring to as the second phase, as the second season of the show. The French text may simply be saying that the second story arc, which is currently airing in Japan, is still in production. That said this may also be our first indication of a second season being in the works. The French article does refer to the first 26 episodes currently acquired for airing in France as the first season. As always I leave the interpretation to you but in the interest of not jumping to conclusions I would say that it is not clearly confirmed that a second year of Sailor Moon Crystal is in the works beyond the initial run of 26 episodes. 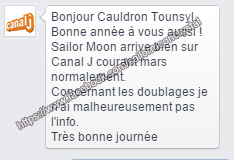 Sailor Moon arrive bien sur Canal J courant mars normalement. Concernant les doublages je n’ai malheureusement pas l’info. Sailor Moon will arrive on Canal J in March. With regards to the dubbing, I unfortunately don’t have any info. Sailor Moon first aired in France back in 1993, two full years before airing in English here in North America. As the first to air the original anime outside of Japan it seems for now that France will also be the first to air Sailor Moon Crystal on TV at all, as it is currently only available on streaming services worldwide, including Japan. With a French language dub of the series in the works I am hopeful that it will also begin airing on French TV stations here in Canada. I used to watch the original French dub of Sailor Moon on TVA on Saturday mornings for a while in the 90s, though they only aired a dozen or so episodes from the first two seasons, despite the fact that all five seasons were dubbed in French.